The Haryana Staff Selection Commission, Is Recruiting Eligible Candidates To The Post Of Canal Patwari Under Irrigation And Water Resources Department, Haryana And Gram Sachiv Under Development And Panchayat Department, Haryana, So Interested People Are Requested To Fill Up The Online Application Form From 21st Of February Onwards. Kindly Do Check Out The Official Notification For Accurate Information, It's Provided Down Below. Total Number Of Vacancies →1,327 HSSC Vacancies 2019, Check Out The Image's Below For Vacancies Distribution. (Credit - The Official Notification Advt No 3/2019). B. Eligible Criteria For This Job Of Haryana Staff Selection Commission Recruitment Notification 2019. 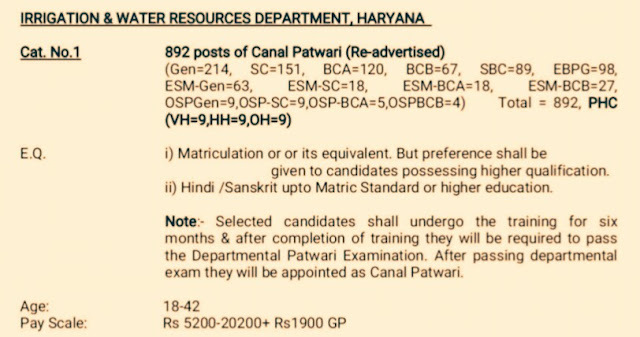 Online Application/Examination Fee →₹100 For General/OBC Candidates & ₹50 For Female General Candidates Belonging To The Resident Of Haryana And ₹25 For Other Reserved Candidates & ₹13 For Reserved Candidates Belonging To Reserved Candidates Of Haryana State. Last Date For Online Application Form →24th Of March, 2019. Now Apply For This Job Of HSSC. Thanks For Support And Till Then Stay Safe And Blessed.